We are up bright and early. Today is the day we would ride to the North Rim and start the crossing of the Grand Canyon. We took turns getting ready in the room at Jacob Lake, and then Seth and Kevin went out a little early to ride around for a bit and stretch their legs. I stayed in the room and tinkered with my bike a bit. We all met back up at the diner at Jacob Lake Inn for a big breakfast. I was having a hard time getting my food down though. I had a really nervous excitement for the day. Part of me was happy and ready to get back to riding and advancing further on the route. Another part of me was terrified that this would be the day that we dropped into the canyon with 50+ pounds of metal and gear strapped to our backs with no way out other than to make it across. Lots of unknowns as well as a daunting physical tasks was messing with both my mind and stomach, but I managed to finish my meal. We sat for a bit more, then said our goodbyes to the staff and headed out. A very kind gentleman offered us some beers to take along for the ride to crack once we got to the rim, but we respectfully declined. Thank you kind beer man, whoever you are! I started to loosen up once we got back on Highway 67. The nerves were still there, but I had time to sort myself out for about 42 miles before arriving at the North Kaibab Trail. I put my headphones in and hammered the pedals. We climbed and climbed the road, not particularly hard at all, just a long and steady ascent out of Jacob Lake. About 10 miles in, the wind started. Let me take a minute to tell you about the winds. They blew straight in your face the whole time. They were the kind of winds where you could be pedaling in your highest gear on an even graded road, and you were barely getting anywhere. And, they only got worse as we went on. Around mile 23, you really get out into some open land with hardly any tree protection and the wind just smacks you right in the face. I admit, I lost my cool a few times on that ride. Peddling your hardest and going so slow is physically taxing and frustrating. I let out quite a bit of "F*** YOU"s to the wind, which seemed to help even though my invisible opponent could not hear me, nor would the wind care even it could. We saw some local traffic on the road that day, and I was hoping that the convenience store across from the Kaibab Lodge would on the off chance be open. Some riders have had experiences with the store being open in the past even though the highway itself and all access there was closed. Unfortunately, the windows were still boarded up and we continued on. The ride was seemingly taking forever at this point. We would see things off in the distance and think they were elk or bison, and then get closer to find out it was just a downed tree, a bush, or a figment of your imagination. It's funny what the mind can do when it's under pressure or bored. Pushing on further, we finally made it to the Grand Canyon National Park boundry. We took a short break here, filtered some water, and ate some snacks. This is where things get a bit tricky. While the North Rim is closed, you are technically not allowed to ride bikes the rest of the way in from the boundry. It is merely ride at your own risk at this point. The other alternative is taking the actual AZT (as I outlined in the first blog entry), but there were still big patches of snow and slop along the trail. In the history of the race and route tours, it has never been a big issue or heavily enforced with the park rangers, and from what I've heard, most rangers don't even agree with the rule. Deciding to stay on the road and accept whatever fate lie ahead of us with the "rules", we hopped the fence and mounted the bikes again. Coincidentally, we eneded up passing several park workers in both directions and they either just waved or continued on, giving us no hassle. Made it to the gates! From that point forward, things started to turn around. We got back down into the trees, shielded from the wind. It's also almost exclusively downhill the entire way to the trail head where we would start our canyon crossing. I got new life with all of these factors in play, and rode possessed. I hopped out in front of Kevin and Seth and really pounded the pedals. Flying down the hills and looking around me at all of the beauty and peacefulness took my mind all over the place. I thought about riding my first bike around my neighborhood with my mom, and how I kept my training wheels on way past the point of needing them. They would rattle around and make terrible noises but I refused to take them off. I thought about cruising around on my Big Wheel, my mother sitting on the sidewalk watching me pop wheelies and pretending her hand was a gas pump to "fill my tank up" when I came over to her. Memories of my grandfather taking me to the tennis courts in the park behind his house and watching me ride around in circles there for hours. Thought about screwing around on bikes at every age with my cousin Dan, enjoying out freedom. My mind took me back to my first major wreck, when my chain popped and went into my spokes throwing me over the handlebars while I was on my way to my buddy Jon's house back in high school. I thought about bike riding on the the rails to trails in Freeport with my dad - we would take our fishing rods with us, ride a few miles down, do some fishing, then ride back. I thought about the pure freedom that you get from being young and being on a bike - every Wednesday in high school Jon and I would ride to Community Market (my first job) where I would get my paycheck and Turner's Iced Tea, go to the bank, then go to Wendy's with the little bit of money that I had left after dropping most of it in savings to buy my first car. I remembered the first time that Megan and I rode bikes together and she had trouble navigating a turn, falling off her bike into a big pile of mulch - we laugh hard about that from time to time. My mind navigated to just a year ago whenever I got my first road bike and Seth took me out on my first ride. I felt like I was going to die on that short 8 mile ride, totally out of shape, completely gassed, and no knowledge of how to shift or ride properly. I thought about all of the great times I had growing up and being on a bike, and realized just how important doing something like this trip was to me. I lost control at this point and found myself with tears streaming down both cheeks, feeling really touched by the memories and thinking about the great places and memories I had cycling over the years, and those experiences and times of my life can never be taken from me. I silently wept happy tears as the miles ticked by, still mashing the pedals and cruising along. The final quarter mile is a steep climb up to the trailhead, and I got off my bike to walk it. Not because I was physically unable to, but because I wanted to savor the last couple minutes I had on this part of the ride, not wanting it to end. That day was one of the best days of my life. Seth and Kevin eventually passed me up and they pumped up the hill to the trailhead. I eventually caught back up at our destination. We made it! 42 slow and windy miles over the past 4 hours and we were finally here. The bathroom was open, and the water was on. The park put an awesome pipeline in place that brings fresh water up from Bright Angel Creek inside the canyon. We filled up our bottles and ate some food, the ramen noodles I made really hit the spot. While we were resting, three Rim to Rim to Rim runners summited at the trail head and we talked to them for a bit. The older gentleman was celebrating his 60th birthday with his nephew and one of his friends by doing the R2R2R run. I hope I'm in that good of shape when I hit 60! We exchanged some stories and those guys dropped back into the canyon to do their final crossing. Seth is a wizard at tying knots, so both Kevin and myself had him affix our bikes to our backpacks for us. I know he really didn't want to, but he helped us out anyway. Thanks again, Seth! The time was here, we were fully rigged up, ready (or not) to drop down into the canyon. Kevin shot a text out to the family to let them know we were about to cross, and then we got on the trail. The three spigots where they routed water - right on the sign! This was it, we were starting our descent into the Grand Canyon - 14.5 miles and almost 6,000 feet down to the Colorado River, then 9 miles and 4,200 feet up the other side to the South Rim! The North Kaibab trail is a true work of art, weaving progressivley downwards through the canyon, with footbridges crossing the creek and washes in multiple locations. This was Seth's first trip ever to the Grand Canyon (and my first to the North Rim), and it did not disappoint. We dropped in around 5:45pm, and the setting sun beaming into the canyon put on a show for us. The red walls were illuminated and fire red while shadows from the opposing canyon walls danced around each turn. Some people say that going down is more difficult than going up, and I fully agree with that opinion. 50+ pounds of awkward and shifting weight on your back, coupled with big 1-2 foot steps downs on a lot of the descent can put a lot of stress on the legs. Thankfully, we decided to bring trekking poles with us, and they proved to be very valuable. Keeping my past injuries and pains to my left knee in mind, I tended to favor my right leg for most of the big step downs to try and keep my left from taking too much of a beating. We would also look out for perfect rocks along the trail that were the right height to rest our back wheels on take pressure off of our packs. Finding a rock that was just right was a blessing, and you couldn't pass it up, even if just for a quick 30 second break. We kept going down and down until night fell upon us, using our headlamp beams to navigate around the cliffsides, calling out potential hazards on the trail and looking out for each other step after step. Further into the night, "eyes" became a recurring theme. The first eye occurrence happened right at night fall. We were taking one of our rock breaks, and Seth spotted some sort of creature in a tree across the trail from us. It was moving back and forth quickly behind the tree and back out to look at us. We eventually got a light shined on it and saw this furry little half fox half monkey looking creature. I had never seen this sort of animal before, but he was a cute little guy. 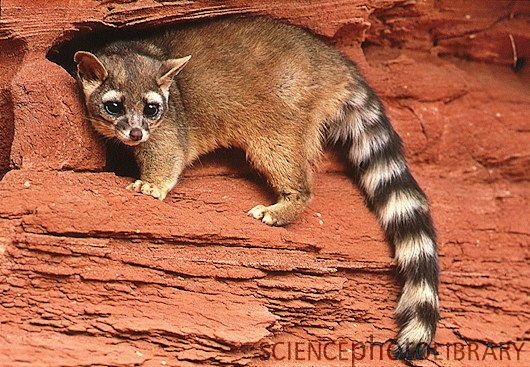 Later on, I did some research and it was a Ringtail Cat. A little further down the trail, on yet another rock break, I told the guys to close their eyes, open them back up, and blink about thirty times, then look up at the sky. It was an old trick I learned somewhere along the line for getting your eyes used to the darkness. We did that and then looked up. The stars were out in full force and it was absolutely beautiful to see them up above the canyon walls. The third eye occurrence happened a little further down the trail at the Pump House Station. We stopped for a short break to eat and get water from the pump. Seth spotted some eyes in the bushes and called Kevin over. I couldn't make out what they were saying as they were down to almost a whisper, but it didn't sound good. Turns out Kevin thought they were Mountain Lion eyes and got really worried. They made some noise and flashed their lights to startle the creature, and it eventually stood up and scurried off. To our relief, it was only a deer. Reports from the race about a week later confirmed that there were multiple mountain lion sightings in the canyon towards the North Rim, so I consider ourselves lucky! Just before the trail started to level out from the descent, I stepped down awkwardly from one of the waterboards and my right knee popped. Kevin asked if it was a good pop or a bad pop (the people out there with knee problems know what a good pop is). I replied with "I don't know" as I did not initially feel anything too out of the ordinary. We got down to the flats and started the long slog towards Phantom Ranch, a lodge and cafe inside of the canyon a short distance from the Colorado River. As the miles ticked by, my right knee started hurting more and more. It was on fire and not getting better. I took some Tylenol at one of our rock breaks and we continued on. We passed through Cottonwood camp, a small plot of land with some dispersed camp sites. It was probably around 1am at that point and I was starting to tire. I pleaded my case and requested that I get a quick 30 minute power nap in and then we could continue on to Phantom. The guys obliged and I sprawled out right on the ground and busted out a quick nap. Also, as a side note for anyone travelling the canyon that could find themselves in an emergency situation, there is a big overhanging boulder about a mile south of Cottonwood that actually gets cell service (never depend on cell service in the backcountry, this is merely a note and might not work for everyone). After waking up from my quick slumber, we continued to push on into the darkness. Around mile 11 or so, my knee couldn't take it anymore and I had to take an extended break. I told the guys to continue on without me, we were so close to Phantom Ranch and I wanted them to be able to have access to a bathroom and a place to camp. They refused to go without me, so we took a long 4 hour break off the trail until the sun came up. It was time to continue on, so we packed everything up and got back to it. It was a huge difference hiking the trail in the daylight. We could see the creek (and not just hear it), see all of intricacies of the canyon walls, and could enjoy it a lot more than pushing into the nothingness of night. With no rest rocks available, we used the bend over technique! We started running into a ton of hikers and trail runners, up early to see the canyon before the heat of the day. Being down in the canyon with your bikes on your backs turns you into an instant celebrity. Everybody wants to stop and talk to you, see what you're doing, get more information, take pictures and video, etc. It's fun conversing with people and talking about your trek, but after a while, it can get slightly bothersome and although you don't want to be rude, you have to start making the conversations shorter and keep moving on in order to not waste much time. Just about a mile outside of Phantom Ranch in the inner canyon, I started hitting my breaking point. My knees were toast, my bike rig had shifted throughout the hike and my tires were slamming into my calves every big step I took, and my hips and shoulders were screaming from the awkward weight bearing down on them for the past 10 hours. I found a good rock and leaned up against it. I wanted to cry, I wanted to stop for another long break, I wanted real food, I wanted it to be over...I wanted a lot of things at that moment. We had to press on though, nobody was going to get me out of this canyon but me, with my own two feet. I closed my eyes for a brief moment and prayed. I had lost my faith back in high school after seeing a lot of things happen to myself and family that in my eyes weren't fair. I did a lot of things that I regret in that time period of my life too. But I put my faith back in God again a handful of years ago after seeing some really amazing things happen to me and people come into my life that I don't think happened on accident. I typically will pray for other people, but I had a selfish moment. I asked for help with this journey and that somehow I make it out of this canyon, no matter the cost or what it would take. I was almost in tears at this point, the pain from my knees, legs, and back was nearly too much to handle. But I composed myself and hobbled on, eventually making it to Phantom Ranch. I knew at this moment that I wasn't going to be able to make it out of the canyon with my bike on my back. I needed that weight off of my knees if I wanted to continue on. A gentleman that we were talking to suggested that I could rent a mule to pack my bike out of the canyon and that they usually come through a few times throughout the day. I went inside the cafe and got the world famous lemonade, and inquired about the mules. The guy working behind the counter, Max, checked with his manager. She came out and told me that I just missed the mules by about an hour, and after speaking with her, I wouldn't be able to use one anyway as my bike would not break down small enough to fit into a pack or duffel that the mules could carry without catching it on the canyon walls. She recommended that I could possibly leave it at the Ranger Station and see what they could do for me, but nothing was guaranteed. Max, seeing my pain and despair, UNBELIEVABLY offered to pack my bike out for me when he was done with his shift in the afternoon. How lucky could I be? It was a serious blessing to have met him and for him to be nice enough to help me out. I can't begin to explain the gratitude I have for Max helping me out. I transferred a bunch of gear between my bike packs and backpack, then Seth rigged my bike up to Max's pack and left it with him at work and agreed to meet on the South Rim in the evening. While I was inside, Kevin and Seth talked with some other people and decided we would take the Bright Angel Trail out of the canyon instead of the South Kaibab. The SK has a lot of cliff exposure, no shade, and no water for the 7 mile ascent out. The Bright Angel is a couple miles longer, but offered shade, water stops, and a much more gradual climb out. The guys got their bikes back on and headed down the trail, while I talked a bit more with an independent guide and we hiked at a slower pace. My new friend and savior, Max. I caught the Bright Angel Trail at the Colorado River junction and headed across the bridge. It was so awesome walking through the middle of the canyon, suspended over the river and all of those years of history. I was limping along at a slow pace, but I was happy that I was able to continue on. I promised myself that I would make it out of the canyon at my own pace, under my own power, no matter how long it took me. Every so often I would come around a corner or switchback and see Kevin and Seth a quarter mile up the trail, but that's about as close as I would get to them for a long while. I saw a rather comedic moment from afar as a train of horses and mules came through the trail and the lead ranger forced the guys off the trail so they could pass. When the horse train got to me, the ranger and all the people riding yelled at me how nuts we were. At the first creek crossing, I dipped my little mesh riding cap as well as my sun sleeves in the water, which was a welcome relief from the ever present sun beating down on me. I also figured out a good hydration strategy - I would come to the creek or water source, fill up my HydroBlu filter bottle, chug the entire bottle to re-hydrate, then fill it back up again and carry on up the trail. This eliminated me needing to fill up a bunch of water bottles and my Camelback bladder, reducing my backpack weight by roughly 10 pounds! Having a filter bottle in the canyon is definitely a smart route to go if you are to make the trip. Most of the next 4-5 miles are a blur to me. They were rather uneventful, just plodding along, stopping every so often to talk to other hikers, eat, filter water / drink, and continue on. I was becoming increasingly more tired and delirious as the minutes passed, sleeping about 4 hours total. I definitely had a few weak moments, smacking my trekking poles off the canyon walls and cursing out loud at the situation I was in. I felt bad that Seth and Kevin didn't have the luxury of dropping the bike weight. I was upset with myself for getting hurt and prolonging this physical endeavor. I was pissed that I wasn't in as good of shape as I thought I was and that we had to pull out of the race, and that my immediate future on this trip was in question. Doing something this taxing and putting your body through torture takes your mind to crazy places. I've read story of ultra runners and cyclists who start hallucinating when doing events. I was definitely in my own little world at this point, mumbling to myself as I slowly made my way up the trail. I eventually caught back up with the guys at Indian Garden, a little oasis about 4 miles from the top. We chatted with a few people there, filled up on water, and headed out. From Indian Garden, it's mostly vertical the rest of the way to the top, endless switch backs (I just glanced over a map and counted 35 of them - not countless I suppose, but it sure felt like it!) and big step ups. We weaved our way up and up, slowly getting closer to the top. The last couple miles of this hike are deceiving. You can look up and see the rim and the finish line. But this is merely an illusion of distance. Not many parts of any trail in this canyon travel in a dead straight line, and you most definitely don't have a direct shot to the top. Instead, the trail meanders with the flow of the canyon walls, dipping in and out of pockets and cresting smaller hills on the cliff face. The destination looks like it could be a mere 20 minutes away, but when it's all said and done, it can be hours worth of hiking. We would pass someone coming down the trail and they would say "you guys have just about a mile to go!" and then after what felt like a mile or two, we would see someone else and they would tell us the same thing. We were completely spent by the time we got to 1.5 Mile Resthouse. The water was shutoff there and we were all pretty much out at that point, with another hour of hiking ahead of us. Kevin brought out a pack of Skittles, and those proved to be magic. We each took a handful, and something as small and stupid as some Skittles gave us enough life and drive to push on for the final mile and a half. Along with my letter to Osprey, I will be writing one to Skittles as well. Switchback after switchback, we ascended. The last quarter mile of the trail is pretty mellow, and I knew we were nearing the finish. My calves were ripped to shreds, feeling like I just spent two days in the gym doing nothing but legs. My knee felt like it was being stabbed by a knife each step I took. I was hungry, tired, and getting cold with the setting sun. Then, it was over. We crested the final switchback and were on the South Rim as the sun dipped down over the horizon. People have asked me what it was like finishing the hike. Honestly, in that exact moment when we hit the summit, I felt nothing. It's odd to hear, I know, but that's just how I felt. Being that tired and frustrated, I just wanted it to be over. It wasn't fun anymore, and I was in so much pain. I remember looking back at the North Rim from where we started, some 24 miles away and 25 hours ago, and let out a small laugh while shaking my head. There was no grand finale, no feeling of joy.... nothing really. All I had on my mind was putting on warm clothes, eating, and sleeping. Max met us at the trailhead and got my bike out of his car for me. We talked for a short bit, and agreed next time I was in Arizona we would meet up for a beer. Once again, a huge thank you goes out to Max who really saved me, I can never fully express how thankful I am for your help. One final look at the Grand Canyon at sunset - we came from left-center on the horizon. Crossing the canyon rim to rim and popping out on the South Rim is nothing short of bizarre. There's lodges, restaurants, tour buses, and hoards of people swarming in every direction. I stood there on the sidewalk next to my bike in the fading light with tourists pushing past me, living their own lives in their own bubble completely oblivious to the journey and hardship we just finished. It's comical really, and I can't really explain that feeling of being there after the hike, but just know it was so surreal after being isolated in a giant dusty red hole for so long. Looking back on it now - the crossing of the canyon - despite my physical misfortunes, was one of the greatest experiences of my life. It was the true definition of Type II Fun (not particularly fun to do, but fun to talk about later). I plan on going back to do R3 (otherwise known as R2R2R, or Rim to Rim to Rim) but without the bikes, obviously. And, if I'm feeling crazy enough, might just have to try the race one more time and carry that forsaken bike on my back one more time. Flashing back to the trip, we began assembling our bikes as nighttime took over the South Rim. The winds picked up and we were cold, but we finally put everything together and went in search of food.